And customers and collaborators play a key role in an ecosystem. Now onto the more intriguing part: how are ecosystems built and managed? What makes a good ecosystem player? How can firms prepare for this role? The framework I am about to show was inspired by my research group’s inquiries into the topic. That is, a research project by myself and my colleagues at Hasselt University, Belgium, in partnership with the Norwegian School of Economics’ Centre for Service Innovation. In as follows, I’d like to introduce you to the intra- and inter-organizational aspects that, we find, help firms become skilled ecosystem partners. Building and managing an ecosystem of shared value is, in essence, the building and managing of individual cultures, structures, processes and metrics, and then securing the synergies between them (across organizations and people). Sounds simple, doesn’t it? Let’s take a close look and find out. To build ecosystems of shared value, firms must first scrutinize the various elements of their culture. For example, they can ask themselves: “Does our organization nurture the values that are most conductive to shared value creation? How does the customer relate to these values?” This process starts with understanding what culture is – both in itself as well as in the industry and/or context in which the firms function. that marketing is an investment and not an expense. For value co-creation to occur, however, firms must also learn to cultivate mutual respect, empowerment and mutual trust vis-à-vis their collaborators in innovation. Mutual respect refers to the appreciation of ecosystem members’ contribution; empowerment is the ability to engage collaborators and help them take ownership of their contribution; mutual trust presumes confidence in others’ reliability and integrity. “Ecosystem partners will contribute to the best of their abilities” is the statement to look for. To illustrate how a firm’s culture can be conductive to value co-creation, let’s look at architecture firm Elemental’s experience. Founded in 2001, Elemental is a self-proclaimed “Do Tank” specialising in public interest projects such as housing, public space, infrastructure and transportation. The firm believes that collaboration is the key to social impact creation. So much so that its design process is entirely participatory. 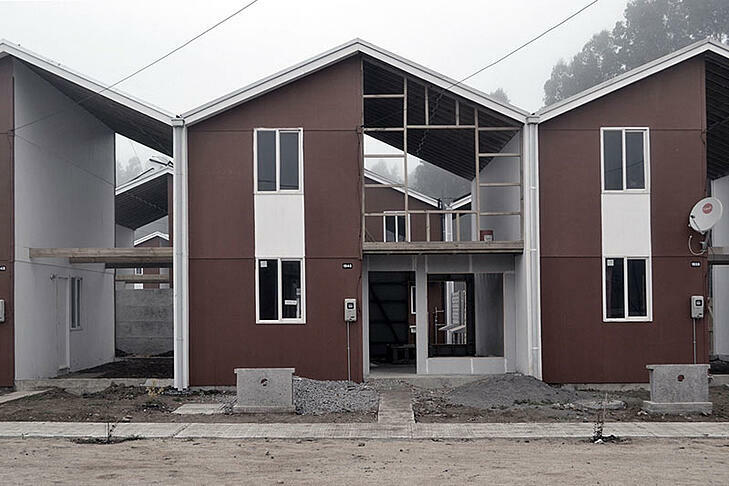 Elemental landed in the spotlight when it was commissioned to help rebuild the small town of Constitución, Chile. The town had been hit by an 8.8 magnitude earthquake, which destroyed over 80% of its buildings. The company’s task at the time was to provide low-income housing for the survivors of the disaster and help them start anew despite general scarcity of resources. Instead of building complete residences, however, the firm built an entire neighbourhood (Villa Verde) of identical, two-storey half-houses. The unfinished half could then be expanded or customised by residents as they pleased and at their own pace. building materials to make it a home. began. Ultimately, the residents would own the houses. The solution offered by Elemental emerged from the firm’s preoccupation with respecting, empowering, and trusting its customers – all key elements of a co-creation culture. By helping residents help themselves, and also by involving other key partners - e.g., local authorities and service providers specialising in sewage, garbage collection, healthcare, education, Elemental built an ecosystem of co-created value. Interestingly, and despite its uniqueness/ ingeniousness, the firm’s solution is proving impossible to replicate to other parts of the world. And this brings us to another element of the ecosystembuilding framework: the rules and norms of collaboration. Developed nations would seldom adopt Elemental’s approach due to customers’ and other collaborators’ perception of the project. Americans, for example, might feel embarrassed to live in such half-houses, while the government would lose face for even suggesting them. norms hinder the ecosystem’s development and stop a possibly life-saving project. Organizational structure, or the “anatomy of an organization” as it is sometimes called, is the second element of the framework. Structure consists of all formal reporting relationships and their sub-components, including, but not limited to: number of levels in the hierarchy, managers’ and supervisors’ span of control, and cross-departmental communication. Essentially, everything related to departments and functions. A firm geared towards its customers and collaborators will typically align its activities to deliver superior value. This includes special response units or special functions like Chief Customer Officers to design, orchestrate, and/or improve customer experiences. Value co-creation, however, requires one additional component: a formal structure for collaboration. Partnering Units or Partner Management departments are common examples as such. Reengineering a firm’s structure to support ecosystems of co-created value is an inherently difficult task. Deep structural change typically starts small via informal coordination activities that cut across existing product and functional silos. In this scenario, well-trained and well-incentivized members of staff not only manage evercomplex collaborator relationships but also take accountability for their actions. A great proxy for whether a firm’s structure helps or hinders value co-creation is, of course, the “permeability” of its walls. Organizations embracing open innovation – or the combination of internal and external ideas as well as internal and external paths to market to advance the development of new technologies, have structures that allow ideas to be spun in and out of the firm as necessary. To illustrate how organizations rethink their structures and become more skilled at co-creating value, I’ve picked an example from publishing and media: The New York Times. This prominent news organization, like many of its competitors, has struggled to remain relevant to readers in the digital age. The New York Times is a daily American newspaper, winner of some 117 Pulitzer Prizes, and generally a symbol of excellence in journalism. 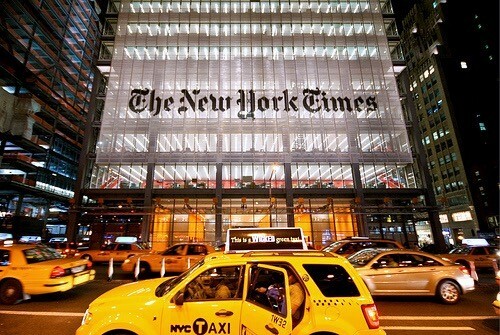 Despite its rank, The Times was not immune to the threat of digitization. Its decision to embrace the ecosystem approach was, in fact, determined by a unique set of circumstances tied to this trend. First, the Washington Post and The Wall Street Journal, its two rivals, had announced digital transformation in order to meet the modern needs of the reader. Second, falling readership, low traffic on the website and generally little reader engagement were signaling the need to change. In pursuit of effective digital transformation and value co-creation, The Times did what it knew best: it ran an investigation and wrote a report. Instead of observing others’ change journeys, however, it carefully analyzed its own. The input for the innovation report was an impressive organization-wide survey. 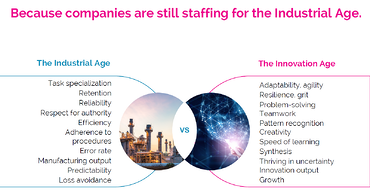 This survey included: taking stock of unused internal assets in the organization, speaking at length to employees and even drawing competitor “cheat sheets” to understand how digital tools were leveraged by others. Once the picture became clear, the newspaper set up a plan to reorganize newsroom structures. This move would help deliver maximum readership value and generate impact. Co-creation at The Times was ultimately achieved through a series of important actions. For example, the company learned to leverage the audience and experiment with user-generated content. Additionally, the Times became a platform for discussion and also discarded the traditional one-size-fits all approach to advertising in favor of interdisciplinary promotion “squads” assembled for each story. In terms of departmental changes, The Times integrated functions like Design, Technology, Consumer Insight Group, R&D and Product and assembled a newsroom strategy team to keep leaders apprised of competitors’ strategies, changing technology and shifting reader behavior. Finally, the Times named a Reader Experience Leader, or a special function in charge of overseeing collaboration efforts. As one of the action points in the Times’ innovation report reads: “Build the newsroom out of Legos, not bricks. The right structure for today won’t be the right structure for tomorrow”. The third element of the framework is all about a firm’s operations. Business processes are actions that firms engage in to accomplish a pre-established purpose or objective. A performance assessment process to ensure the organization’s strategic aims are reached. For value co-creation to happen, however, processes must be taken one step further. For example, the firm must encourage two-way communication with its customers as well as other collaborators in the ecosystem. Similarly, the performance management process must facilitate learning from all parties. These subtle distinctions are illustrated in a self-assessment guide, which can be found in the full paper here. Just like the structural changes, process changes also involve a step-by-step approach. For a start, and depending on their necessities and level of expertise, firms can make or buy IT systems of varying complexities to automate parts of the value co-creation process in their ecosystems. Next, firms can map their processes to better understand the possibilities for creating new value. Finally, firms can audit their processes internally, making sure they are aligned to the value cocreating mission. How does a 161-year-old British label known for its iconic trench coat employ the notions of collaborator focus and value co-creation to revive an otherwise traditional business model? By doing, as YouTube personality Casey Neistat would have it, what it cannot. That is, by breaking free from established industry norms, embracing collaboration and laying the groundwork for an ecosystem of co-created value. Under the guidance of Chief Creative and Chief Executive Officer Christopher Bailey, and driven by its core values “protect, explore and inspire”, Burberry today leads a movement that could help cool an overheated fashion system. Today, designers, retailers and fashion organizations are showing support of the British label’s “buy-now-wear-now” approach, which promises to bring customers and brands closer together and slash useless anticipation. That is, the inability to order collections directly from the runway. Finally, Burberry removed duplication across functions and between the regions and its corporate centre to streamline operations. 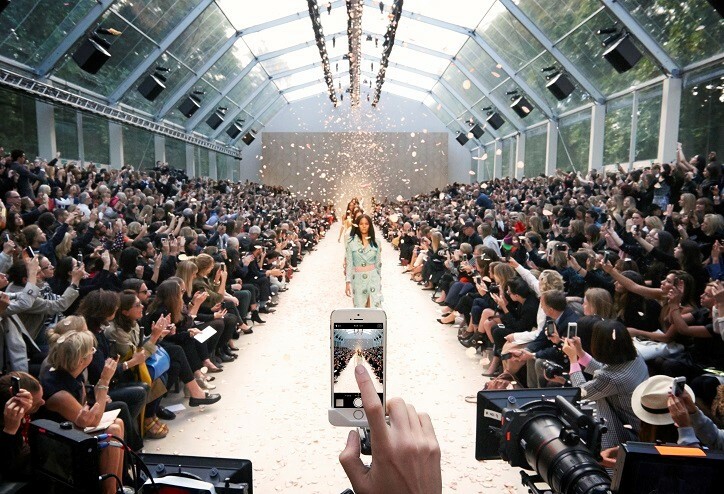 Alongside its processes, some other ways in which Burberry nurtured relationships with is customers and other ecosystem members included the work done via the Burberry Foundation. At the same time, partnerships with technology giants like Google for Burberry Kisses helped the label “democratize luxury”. By making its brands more visible to various categories of customers, and also enabling customers to combine Burberry items with lower-end brands, the firm created new avenues for innovation and value co-creation. The fourth and final of the organizational element mentioned in our framework is collaboration metrics. Metrics refer to the variety of tools organizations and their leaders use to assess performance; for example, the performance of their employees, of their innovative product and service portfolios, customers’ satisfaction etc. Firms today will often develop entire scorecards with Key Performance Indicators (KPIs) to assess the effectiveness of their open and collaborative innovation programs too. Open innovation (OI) performance measurement systems are now trending as more and more organizations seek to understand how collaboration can add to the bottom line. (Also see this article for more insights on KPIs and measuring innovation). First, such metrics can motivate employees more effectively to meet customer and collaborator needs by offering the right incentives. Second, metrics can help managers determine the financial implications of their customer and collaborator-focused decision-making. Hard metrics such as number of co-creation projects or idea campaigns, the number of employees involved in open innovation initiatives, and the intensity and duration of the co-creation project can all be accounted for on a regular basis. At the same time, understanding the level of customer satisfaction, trust, intention to collaborate repeatedly must be monitored if collaboration between ecosystem partners is to be sustained in the long run. Despite the continuous emergence of new metrics to capture customer focus and co-creation, effective monitoring remains a difficult task. Customer loyalty, advocacy, reduced price sensitivity in particular pose this problem. An additional complication is related to keeping track of how the metrics change as a firm undergoes transition – e.g., from product-focus in an alliance to value cocreation in an ecosystem. Decisions to downsize or outsource, for instance, can lead to increased profitability in the short run, but might erode carefully accumulated customer satisfaction in the long. As a general trend, hard metrics like revenue and speed of gaining market share remain critical in certain areas of a customer-focused organization. Complementing them are softer metrics that capture insights from online listening (customer perceptions, for example), sentiment analysis, and data mining as of recent years. Fujitsu Services, an information technology and equipment services company (whose parent organization owns some 97,000 patents worldwide) has a unique approach to measuring the effectiveness of collaboration and value co-creation in its ecosystem. In an interview with Joachim Box, Business Director at Fujitsu UK & Ireland, I learned that collaboration is, in fact, viewed as a conversation with customers over the long term. Fujitsu starts by identifying challenges and business issues that a particular customer or sector, might have and looks to collaborate in those key areas. While the latter could be (wrongly) viewed as selling innovation consultancy, the company focuses on learning from customers’ and other stakeholders’ experience and then improving that experience so that the entire ecosystem is better off. A recent example is a collaboration project with a major airport. While developing the “digital ear” – a device that sends an alert when the noise level is very high, allowing staff to see whether aircraft engines were running longer than necessary – the company worked in iterations, showcasing development rather than a finished product. Understanding whether the customer or collaborator is prepared to work with the company again. To this end, a so-called “voice of the customer” program, whereby a third party carries out surveys and interviews with the customers, was put in place with great success. Soft metrics in particular are very useful in understanding when and how attitudes towards Fujitsu are changing as a consequence of the co-creation exercise. At the same time, monitoring these metrics helps expand a consistent approach around the globe. That is, wherever a customer engages with Fujitsu, they get a similar experience leading to consistency in collaboration. To read more about the Fujitsu innovation story, see the HYPE case study with Joachim Box. Last but certainly not least, we come to the rules, norms, meanings, symbols, practices, and similar aides to collaboration in an ecosystem. Such aides to collaboration are perhaps the most important elements of the framework, given their specificity as well as extraordinary influence on the relationships between partners. It follows that managing the “rules of the collaboration game” effectively is an essential part of value co-creation. In fact, organizations that do not consider rules and norms as part of their strategy frequently fail to support healthy ecosystems in the long run. According to management theory, the basic function of these rules and norms is to provide cognitive shortcuts, reduce uncertainty and, ideally, create stable expectations of the behavior of others. Hard (binding and policed) and soft (rules of thumb, suggestions). While there are no right and wrong distinctions, the aforementioned categories are only meaningful in context. Shaping effective rules and norms takes time and effort on behalf of all ecosystem partners (including the customer). As a very first step, partners must be aware of the various types of rules governing their interactions and manage these effectively. In the pharmaceutical industry, for example, regulatory challenges are a typical example of how rules can severely hinder cocreation. With the advent of modern medical procedures such as utilizing a patient’s own tissue as part of the treatment (cell therapies for bone reconstruction), authorities struggle to establish frameworks that will govern research in the field. Staying in the realm of pharma, and to better understand the extraordinary importance of rules and norms for collaboration, let’s analyse Novo Nordisk’s journey. But first, some context. According to a recent PwC prognosis, the outlook for the pharmaceutical industry has never been more promising. With new tools to develop breakthrough medicines materializing every day, demand for products escalating and trade becoming easier, the ingredients for sustained growth appear to be in place. Digitization and changes in the competitive landscape: IT companies become the new rivals due to ability to collect, store and process big data, and the increased necessity to measure the impact of medicine in the real world. Under these circumstances, healthcare and pharmaceutical companies are increasingly learning to use their resources more effectively and focus on establishing patient focused service ecosystems in order to prosper and create value. Understanding the archetypes of their target markets and having a multi-dimensional view of patients, interacting with patients in a more relevant manner, identifying challenges and business issues that a particular patient group experiences and launching a collaboration based on those, asking key evaluation questions (“Would the patient be prepared to work with us again?”) are all important practices that pharmaceutical companies can adapt from other sectors such as retail, beauty, telecommunications and logistics. Some important practices that such organizations must master in order to build and sustain patient-focused service ecosystems, however, is managing the relevant rules and norms of collaboration. At Novo Nordisk, a Danish multinational and world leader in diabetes care, the “rules of the collaboration game” have been recognized and managed from the start. Novo has worked actively with a number of important stakeholders, including but not limited to: caregivers, patient associations, independent research organizations, payers, ministries etc. 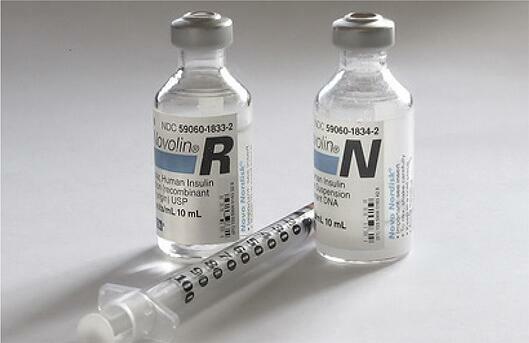 to provide patients with better health outcomes. For example, the company has helped lobby for better legislation and has improved on-going practices in developing countries, making sure that diabetes educators have the necessary resources to continue their work. At the same time, Novo has employed various types of IP to create links with stakeholders while maintaining the open and collaborative approach to R&D. Moreover, Novo was involved in resolving important societal issues by assessing the effect of the pharma value chain on climate change. In this context, Novo Nordisk partnered with AstraZeneca, Baxter, GlaxoSmithKline, Johnson & Johnson, Pfizer and The National Health Service Sustainable Development Unit to publish the first international guidelines for calculating the carbon footprint of pharmaceuticals and medical devices. Finally, Novo has worked extensively with creating more accessible language to patients by joining EUPATI – The European Patients’ Academy on Therapeutic Innovation. Creating an ecosystem of co-created value and sustaining this ecosystem in the long run is not an easy task. As we have seen, culture, structure, processes and metrics all need to be aligned in order to reflect and cater to the needs of the ecosystem partners. Culture in particular, plays a strong role. Exhibiting mutual respect, empowering and showing mutual trust are key to successful innovation projects. 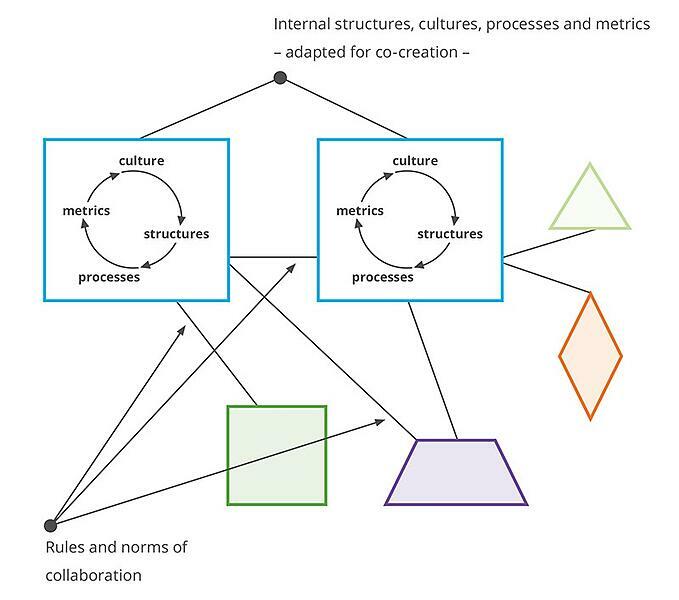 Similarly, understanding the “rules of the collaboration game” can help untangle the complex dynamics of ecosystems. More often than not, projects come to a standstill precisely due to misalignments in strategy, confusing language or simply cumbersome IP agreements. For value co-creation to occur, resources need to flow smoothly and evenly, and ecosystem members need to acknowledge their contribution and worth. Ultimately, ecosystem management is relationship management. And relationships require time and commitment. Before jumping to the conclusions, I invite you to take a self-assessment test and reflect on whether your organization nurtures the elements of collaboration and co-creation. You can find the self-assessment in the full white paper here.